14 cycles (tested in acetophenone reduction) with only 0.4% mol of metal leaching into the organic phase during the extraction of the product. Quite unexpectedly, Xiao and coworkers found sensible rate acceleration of ATH of ketones using unmodified TsDPEN-Ru(p-cymene) complex in neat water , this behaviour being also observed with several of the ligands active in organic solvents  and TsDPEN-Ir(III)- or Rh(III)-complexes . Using the ''on water'' protocol (substrate and catalyst are insoluble) or micellar catalysis  up to 10,000 S/C ratios became feasible and reactions could be performed without inert gas protection to give a variety of simple and functionalized secondary alcohols in high chemical and optical yields. Mechanistic investigation of Ru-(R,R)-TsDPEN promoted ATH of acetophenone in water with HCOOH/triethylamine azeotrope revealed a marked dependence of reaction rate and catalyst enantioselectivity with solution pH, so that the adjustment of initial pH to 5 was required in order to achieve results comparable with those obtained using HCOONa as hydrogen source. It has been suggested that the concerted mechanism proposed by Noyori through a cyclic hydride intermediate could be operative at high pH, with formic acid mainly existing in its dissociated form, whereas at acidic pH the protonation of the coordinated ligand could lead to uncyclic and less-organized transition states giving rise to decreased selectivity  (Scheme 3.4a). More recently ATH has been extended to C-C unsaturated bond and in the reduction of a series of b, b-disubstituted nitroalkenes using different aqueous conditions [32, 33] the highest enantioselectivities were obtained with Ir(III)-aquacomplex 17 (Scheme 3.4b), a catalyst shown to be effective also in the reduction of a-cyano and a-nitroacetophenones . Enantioselective carbon-carbon bond forming reactions are usually carried under Lewis acid catalysis and the use of aqueous solvents has been long precluded since many metals react with water, that act as Lewis base, rather than with substrates. Strictly anhydrous conditions and suitable protection of reactive functional groups are often required for such reactions, but a substantial breakthrough in this field was achieved by Kobayashi and coworkers that developed Sc(III)-, Yb(III)- and Ln(III)-triflates as water-compatible Lewis acids and demonstrated an activation role of water in the Mukayama aldol reaction between benzaldehyde and trimethylsilyil enol ether of cyclohexanone, for which only 10% substrate conversion had been observed in THF with Yb(OTf)3 . The catalytic activity of several metal perchlorates, triflates and chlorides in a model aldol reaction was correlated with hydrolysis constants (Kh) and water exchange rate constants (WERC) for substitution of inner sphere water ligands. The screening revealed that other than rare earth metals also Fe(II), Cu(II), Zn (II), Ag (I), Mn(II) and In(III) worked as Lewis acid in aqueous medium, the optimal pKh ranging from 4 to 10 with WERC values greater than 3.2 x 106 M-1s-1 . Within these intervals, cations are stable to hydrolysis maintaining sufficient Lewis acidity to activate the aldehyde, that can be coordinated to the metal only if a fast exchange with hydrating water molecules occurs. 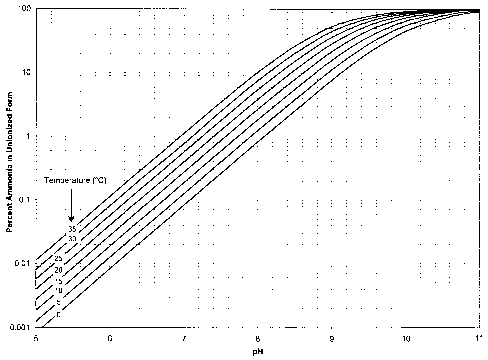 Many triflates of the above metals have then been used in aldol reactions with moderate to good enantioselectivity in water-organic cosolvent mixtures [37-40] and sensible acceleration rate was observed in the presence of surfactants . Taking this evidence, Lewis acid-surfactant combined (LASC) catalysts were developed by using dodecylsulphate (DS) as counterion for the active metal cations, the most common of which was scandium. The resultant M(DS)3 salts formed stable emulsions and micellar aggregates (1 im diameter) able to promote the concentration of organic substrates by hydrophobic interactions, so that effective reactions could be performed in water without the need of any organic solvent . Scheme 3.5 Examples of Sc(DS)3-promoted asymmetric reactions and harmful procedures required to generate the anhydrous aldheyde offering a notable simplification in hydroxymethylation reaction, an efficient method to introduce a Cl-functional group at the a-position of carbonyls. The same system Sc(DS)3/18 catalyzed the ring opening of meso-epoxides with aromatic amines to afford optically active b-aminoalcohols without diol formation  and also C-, O- and S-nucleophiles reacted with comparable high yield and enantioselectivity  (Scheme 3.5b, c). Scheme 3.6 Reactions with water-tolerant or ligand stabilized Lewis acids enantioselectivity  (Scheme 3.6b). The discovery that some water-sensitive Lewis acids can be beneficially stabilized upon coordination with chiral basic ligands made feasible Mukayama aldol reactions in the presence of Bi(OTf)3 or Ga(OTf)3 (Scheme 3.6c) and further application of this concept could expand the portfolio of asymmetric reactions in aqueous media . and used ''on water'' in the direct aldol reaction of ketones with aromatic aldehydes or b, y-unsaturated a-ketoesters  providing higher yields and stereoselectivities than those obtained in organic solvents (Scheme 3.7a, b). It has been suggested that stereoselectivity in such reactions is controlled by the apolar sub-stituents since the aldehyde, in its approach toward the enamine, preferentially lies in the hydrophobic region of the catalyst rather than in the hydrophilic one . With the same approach, O-hydrophobically substituted threonine  or serine  as well as some peptide-type derivatives [56-58] have been prepared as useful catalysts for aldol condensation of ketones or silyl-protected hydroxyacetone and their performances were improved by addition of an acid co-catalyst to stabilize enamine formation or using brine as reaction medium to promote concentration of catalyst and reagents by salting-out effect (Scheme 3.7c). 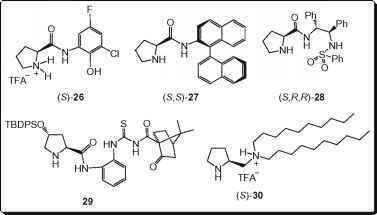 More recently the catalytic activity of natural aminoacids in aldol reactions has been screened and those bearing more apolar residues, as trypthophan, leucine or isoleucine, displayed satisfactory selectivity further increased in some cases with 2,4-dinitrophenol additive [59, 60]. Three-component Mannich reactions of hydroxyacetone with aldehydes and p-anisidine were also performed with excellent yield and selectivity in the presence of threonine derivative 23 using water as sole reaction medium  (Scheme 3.7d). Some proline-containing amides, sulphonamides and thioureas as 26-29 have been designed in order to have a secondary amino group for enamine formation, an amide group on a chiral center for hydrogen-bond directed stereocontrol and a hydrophobic group to promote aggregation of catalyst with reactants in water environment. All these elements contributed to fruitful catalysis in aldol and Michael reactions in aqueous systems  and even if the role of water was not fully rationalised  its positive effects could be ascribed to the increased acidity of amidic NH bond due to the hydrogen-bonding between the carbonyl of amide and water free hydroxyl groups at the hydrophobic interface of the catalyst. In some specific cases it has been proposed that the formation of an organized transition state could beneficially occur through a water molecule engaged in two hydrogen bonds bridging the catalyst on one side and the aldehyde approaching to the enamine on the other one [64, 65]. In the group of 2-substituted pyrrolidines, diamine salt 30 bearing long alkyl chains can be considered a hybrid surfactant-organocatalyst and it promoted aldol reactions in bulk water with excellent selectivity and high yields, remarkably obtained with reagents in stoichiometric ratio (Scheme 3.8a) . More recently it has been reported that the aldol condensations valuably proceeded with only 1% mol of 30 in the presence of stearic acid; the reactions occurred in an emulsion rather than a biphasic system  and the products could be easily isolated by centrifugal separation leaving the catalyst to be recycled in water. Compound 30 was also active as catalyst in Michael addition of nitrostyrene to ketones in brine and in a multigram scale synthesis of adduct 31 the enantiopure product was isolated in good chemical yield by simple precipitation from reaction mixture and subsequent recrystallization  (Scheme 3.8b). 73% syn isomer,>99% ee Scheme 3.8 Hydrophobic organocatalysts and related reactions in water specifically designed for its easy recovery and recycle, also displayed good selectivity in the same asymmetric transformation and diiminium intermediate 33/cynnamaldehyde was structurally characterised by X-ray analysis .